Early in my yoga teaching career, I guided a group of five website developers in a corporate ‘one-off’ that a young, confident business owner from Sydney arranged. He called it a chance for his staff to do ‘something different’. Within the practice I guided a tall lanky man with an awkward gait through a chilled, gentle practice. He was clearly uncomfortable on the yoga mat. I got the impression that he felt anxious being with me, a stranger, in the small studio space. I tried being warm, humorous, simple… but nothing worked to calm him and by the time the hour was over he was drenched in sweat, and I swear it wasn’t the heat in the room or the pace of the class. After sitting with him and the group for a while, he started to open up and he showed me the hypermobility of his joints. He could turn his leg so that his foot pointed straight out behind him and it seemed that every joint in his body had similarly exceptional ranges of movement. Yoga was new to him and he had no idea where his own body would go in the practice. He was used to sitting in a chair and keeping his body as still as possible because he couldn’t trust it not to do anything wild. His proprioception – perception or awareness of the position and movement of the body – was completely out of kilter and his levels of anxiety were at towering heights. I wanted so much to assist him in being present and comfortable in his skin. I never saw him again even though I practically begged him to continue exploring this method of connection. That was a major fail for me, thank The Goddess for the Yama of forgiveness… What’s that you say? No such Yama? I’ll go with Ahimsa and Santosha then, some healthy compassion and contentment. The silver lining is that I’m a lot bossier these days when it comes to connecting with self and igniting proprioception and interoception in my classes. Why is it so important to me? 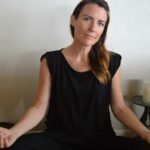 Because I’ve not only experienced first-hand the way that becoming present helps alleviate anxiety and depression, I’ve been told numerous times over the years from people who practice with me that it helps them. I’ve also seen the long descent down the rabbit hole that comes from losing connection to self. That to me is reason enough to champion the practice of proprioception. Start in restorative rest pose; lying on your back with your knees either bent or resting on a bolster, soles of your feet on the floor. Drop into your body, connect, feel the floor under your body – all the points of connection – and the weight of your body releasing down into the earth. Notice that you no longer need to hold yourself up, you can release and let go. Notice your breath. Sometimes it helps to have your hands resting on your belly, so you can be aware of their rise and fall. How are you feeling? Are there any sensations of pain or discomfort? How are your energy levels? Bring your soft awareness to your mind, how are your thoughts? Is your mind busy? Notice your thoughts without trying to change them and then slowly begin to move your soft focus back to your breath, the sensations in your body and your connection to the earth. With the information that you are receiving in this pose you can inform your practice. It’s right there in the word INFORMation. You can be the judge of what you need. You know your body best. Take a pranayama that works for you. One that may work well is to slowly make your way to a seated cross-legged position, find your sit bones as they connect to the earth, notice the way gravity draws you down but the energy of you rises back up. Breath through your nose if you can, and perhaps practice Ujjayi breath with a slight restriction at the base of the throat. On your inhale lift your arms and your gaze, then with your exhale twist to the side allowing the opposite hand to touch lightly on the opposite thigh and the other down to the floor beside or behind you. Inhale back to centre with the raised arms and gaze, exhale to the other side. Notice the moments of suspension between each phase of the breath, and honour that moment of stillness before the breath flows again. Move through a vinyasa of your choosing but in keeping with gentle kindness, so no pain. Try moving with your toes and fingers connected to the floor in any poses where you would normally lift them, as though you are making patterns in chalk on the ground. After you’ve moved for a while – say, the time it would take you to do three salutes to the sun – come down to child’s pose or a seated pose and centre again. Notice; is there any pain now? Discomfort? Tension? How is your energy? Your breath? Be aware.Continue to move through a flowing sequence at a different level than before, on hands and knees perhaps, or if you were at that level before then standing or lying down. Be aware of the sensations that occur within your body. Move when you want to move, be still when you want to be still, flow like a dancer, or rest but always listen and respond. Become the curious child who hasn’t yet been told to be still and quiet, and then stay that way; out in the world, at work, in bed, at home, in your relationships and in all of life. If that means an enormous change for you then start slow. Lie down and notice. How is your body now? Is there pain that wasn’t there before? Feel the way that your breath moves your belly up and down, the way your chest moves. Rest one hand on your belly just beneath your belly button, the other under your rib cage or perhaps on your sternum. Notice the way your breath moves your hands gently up and down and away from each other and then towards each other again. Practice self-love. This is your body and you reside within it, be present and don’t try to make it do things that it’s not comfortable with. Come home and leave behind the insta-yoga, trade it in for intra-yoga. The yoga of connection.